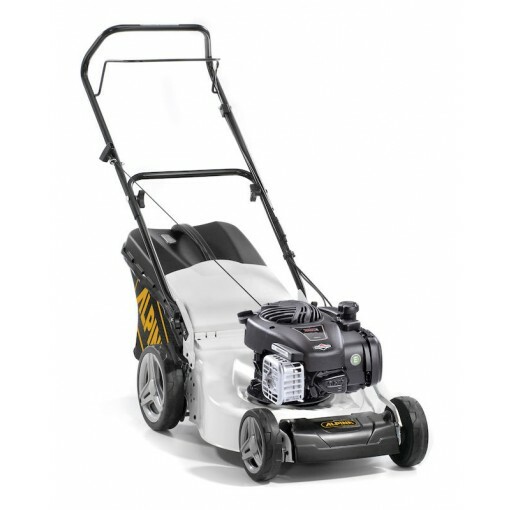 ALPINA PETROL LAWN MOWER AL3 46 B: Top collecting lawn mower with additional rear discharge function, the Alpina AL3 46 B is a robust, push lawn mower made of steel, 46 cm cutting deck. Equipped with Briggs & Stratton engine 125 cc, 60 L grass box, ergonomic adjustable handlebar and wheels on ball bearings. Suitable for medium gardens up to 1600 m2. 3 in 1 function: 3 in 1 function allows you to collect, mulch, or rear discharge your grass clippings depending on your needs. Centralized height adjustment: The cutting height can be easy and fast adjusted by the use of just a single lever. Ergonomic handle: Ergonomic handle comes from a special design which reduce your arms stress due to the use of your lawn mower. This handle will make it even more pleasant to take care of your lawn. Foldable handle: The handlebar is equipped with a special device which allow you to fold it in order to save space when storing it. Full grassbox indicator: Thanks to the full grassbox indicator you will no longer need to continuosly check the grass bag or wait until the lawn clippings falls on your lawn. This indicator will easily let you know when it is time to empty it. Handle adjustable in height: The use of your lawn mower is even more comfortable thanks to the possibility to adjust in height the handlebar. Take care of your lawn has never been so relaxing. High wheels: Rear high wheels grant you elevate machine balance and a perfect traction even on sloping and rough field. Multiclip mulching function: The Mulching function cuts grass clippings into extra fine particles and recycles them into the lawn as a natural fertilizer, plus there is no need to stop and dispose of grass clippings, saving you time and money. Wheels on double ball bearings: To have wheels on double ball bearings makes the use of the lawn mower very smoot and pleasant while extending also the life of it thanks to higher quality components.